In this watercolor lesson, you will discover how to create lively and vibrant colors that can't be achieved any other way. Instead of flat and muddy colors, you too can produce glowing colors consistently. You do by a method I call 'mingling'. Through mingling, you blend the colors, but ensure that each color still retains its hue and does not dull the other colors. With this technique, you can apply paint directly to the paper- thick or thin, side by side, and warm against cool. You will have fewer flat passages (or none). Mingling speeds up the painting process. You can get by with little pigment or water or no glazing. If you have always dreamed of creating glowing your watercolor paintings, then change the way you blend your watercolor paints! You will have cleaner and richer colors. 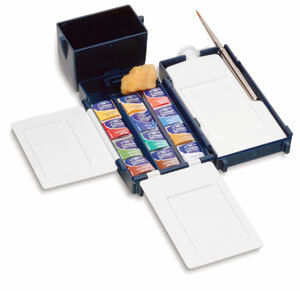 To me, it is the smart and efficient way to mix watercolors! 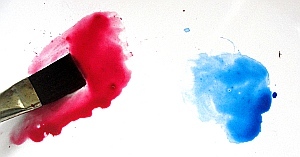 Prepare puddles of two separate, juicy colors next to each other on your palette. Make sure the consistency is fairly liquid. The edges of these two colors should not touch at this stage. Apply the first color on a piece of dry, flat, and level watercolor paper. Load your brush (preferably a round one) directly. Clean your brush and remove excess water. Don't skip this step! Load the same brush from the other puddle of watercolor paint and apply it next to and touching the edge of the first color. 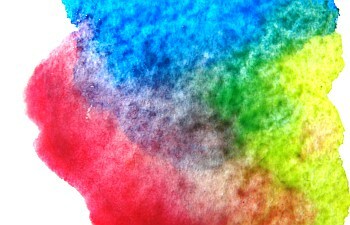 You can add more colors; just be sure to rinse and blot the brush before each use. One tip on top of the steps above- you can double load your brush when painting grays. 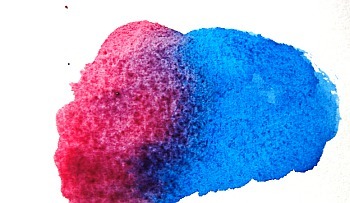 To do this, mix three puddles of pigment on your palette. Always choose transparent colors for this purpose. Opaque colors will not do well. Use 300 lb cold press paper for this purpose. It will stay wet longer and allow the watercolor paints to blend on the surface and into the paper. A pre-stretched 140 lb cold press paper will also work. Click here to learn how to stretch watercolor paper. Work on a flat surface, instead of a tilted board. Allow the paint to move on the surface and into the paper. Know your colors before you start a painting. Practice by mingling small swatches from your palette. This will reduce any unpleasant surprises. Go back while the whole area is still wet. Be careful about the amount of water on your brush. Dropping more water into an already wet spot causes blossoms and the water will push away the surrounding paint (of course, you might want this effect). 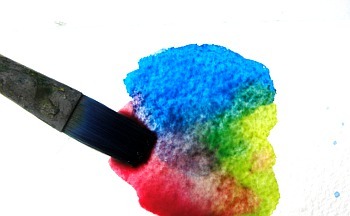 To avoid this, remove the bubble on the end of the brush before working with the mix by touching the brush to a dry rag. Your brush will pick up moisture from the wet surface, so dab it onto the rag each time before you apply the paint to the paper. To mix glowing watercolor takes some practice. You will need to relearn how your colors interact with each other when mingling. I hope you have learned something valuable from this watercolor lesson.